It always amazes me when we do our year-end review and look back over the past 12 months how much we have accomplished. Even in hard years it is good because we can see that we really did a lot on the homestead despite everything we struggled with. Oliver, our English Angora Rabbit, was sheared 4 times this year, produced about 8 oz of fiber this year. Started the year with our amazing 13-year-old farm dog, Tundra, working the barnyard alone because the OTSC dog, Finley, was clearly not going to work out as his replacement. Bought a 10-month-old Anatolian Shepherd, Anya, in the spring to work with Tundra and be the future replacement LGD. Tundra died of old age at the end of July. Anya is continuing to mature and be trained to be our lead LGD. Spent $112 on the garden this year, average of $0.36 per lb. I completed the following knit projects: 6 pairs of socks, 2 toddler size sweaters, 2 balaclavas, 1 hooded scarf, 3 stuffed Easter Bunnies, and a pair of hunting gloves. And I extended the length of the Farmhouse shawl that I made last year. I also made one felted Christmas ornament. I sewed 10 skirts, 24 cloth placemats, 48 cloth napkins, 3 toddler bibs, finished 1 crosstitch bookmark, and we made one batch of coffee-ground soap. Plus innumerable amounts of mending and patching of clothes. The girls did countless projects, each of them finishing more projects than I did. I didn’t keep track of them, but I do know they sewed those 12 quilted hot pad trivets to match my placemat/napkin sets, and 80 backpacks and 232 facecloth hygiene kits for Operation Christmas Child. We didn’t keep canning stats this year, we were just too busy. But we did do some canning. Definitely less than usual. In January we stayed warm and cozy inside while the snow flew and the outside temps stayed low. We did brave the cold to work on several barn projects, remodeling and making things better suited for our needs. We started a no-pre-processed-food challenge. We worked on many heritage arts projects, including sewing, knitting, and soap making. We also prepared for our first goat kids to be born. February brought the first goat kids to the farm. Heidi kidded adorable, colorful, tiny, triplets. The birth was an adventure, since the first kid was breech. But they all survived and we enjoyed the adorable antics of three babies. And those weren’t the only babies on the farm in February, our 33 chicks also arrived and we enjoyed having them in the brooder in the house. March had some gains and some losses. We had a very sad and scary delivery for our goat Gretchen. Her kid did not survive the ordeal, and we were barely able to pull Gretchen through it. We sold two of Heidi’s kids as bottle babies and kept one doeling with her. We began to get goat’s milk that we could use for our family, which was a huge blessing. And our first lamb arrived earlier than we expected, but healthy and doing well. She was the first second-generation lamb born on our farm. We purchased her granddam, Daphne, who lambed her dam Violet for us, and then Violet lambed Daffodil. It was a fun milestone birth. April brought more gains and losses and was a very FULL month on the homestead. We had twin ewe lambs born and sadly lost their mother right after birth, which left us with bottle babies. We raised them a few weeks before selling them. We also sold Heidi and her doeling, leaving us with one doe in milk. We then had two more single lambs born, a ewe and a ram. The chicks were big enough to integrate into the adult flock. We started setting up the garden and had a ton of seedlings sprouting indoors waiting to go out. We bought our new Livestock Guardian Dog, a 10-month-old Anatolian Shepherd puppy. Tundra (our head LGD) helped us begin her training. 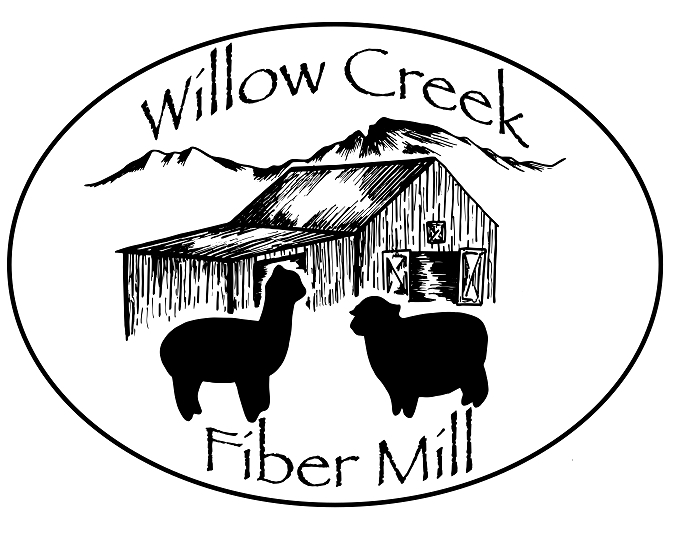 And we opened our new business – Willow Creek Fiber Mill. Whew! That was a super busy month! In May I had trouble concentrating on work around the farm because the adorable antics of baby lambs in the barnyard made it hard for me to pull myself away from the fence. Thankfully, I was able to resist the temptation enough to get some stuff done. We got some seedlings moved into the gardens and spent a lot of time working on Anya’s training. Mid-month we were buried in a deep, wet, spring snow. It caused some damage to the berry bushes, but for the most part was just a fun distraction. June weather meant that the last of the seedlings could move out into the gardens. We were able to begin harvesting some herbs too! We built some more fences and started battling the flies trying to eat the dogs’ ears. We found the fly collars to be pretty effective, though short-lived. The girls and I kept busy with sewing, knitting, and needle felting projects. We attended some fiber festivals and enjoyed watching our fiber mill business grow. And we had our first broody hen of the year start setting. In July we butchered the cockerels, along with our older goat. We got a new milk goat, which quickly turned into two new milk goats because she refused to eat from loneliness for one of her own kind. The gardens started producing well and we were able to do some early harvesting. We were surprised by how well our cabbages did and enjoyed an abundant harvest of them which we made into sauerkraut in our big crock, and coleslaw too. We did some more barn fixing up and remodeling. The pullets started laying and our broody hen hatched out her chicks. Towards the end of the month we experienced our hardest loss ever on the farm when our wonderful old lead LGD, Tundra, died. He had been part of our family for 13 years, and was such an excellent farm dog. It was a loss that shook us all. Early August brought a terrible rain storm that flooded the barn. We had to tear up all the floors and spent a lot of time digging ditches to help prevent future issues. Our garden continued to produce well and we were busy harvesting and preserving the harvest. We butchered one of our sheep and made broth with the soup bones, in addition to freezing a lot of great meat. Our son’s medical issues came to the forefront and everything else was put on hold while we dealt with surgery, a hospital stay, and follow up appointments. September was mostly focused on our son’s medical stuff. But the coming of the first frost also necessitated a lot of garden work, harvesting, and putting up of the harvest. We were very happy with the bountiful harvest we had this year, FAR surpassing all previous years. We also had trouble with bears as they began their push to put on weight before hibernation. Thankfully, none of our animals were killed by the bears. October meant our gardening season came to a close. But we were happily enjoying the fruits of our labors with delicious meals inside made completely from our farm. We continued with Anya’s training (which had been going on since April). I did a LOT of knitting and tried a new sock method. And we had two more broody hens decide to set and hatch out chicks. We worked on Operation Christmas Child projects and enjoyed preparing for the big box packing day in November. Our sheep got loose and gave us an adventure, and at the end of the month we put our ram in with the ewes for breeding. In November our sweet little Angora bunny, Oliver, died. I continued my knitting spree and we made our first ever dog-fur yarn in the mill. We all got very very sick with croup, strep, and pneumonia. Somehow I found time to finish my last set of seasonal cloth placemats and napkins. December started out unseasonably warm, with only two brief cold snaps, but ended with some bitterly cold days and nights. We enjoyed working on homemade Christmas gifts and dealt with more medical crisis. We made the hard decision to downsize the farm for the unforeseeable future while we continue to juggle our son’s medical issues – and thus we are down to just chickens, gardens, the guard dog, and barn cats on the farm. It has been an exhausting but productive year. We hope that our move towards downsizing and simplifying the homestead for 2018 will bring peace and prosperity to our family as we continue to battle the unknown of our son’s medical issues. We look forward to another year full of adventures, productivity, and good memories. We are blessed. This entry was posted in Anatolian Shepherd, Chickens, Dairy Goat, Farm Dog, Gardening, Heritage Arts, Sheep. Bookmark the permalink. That is a LOT of produce, and WAY to many eggs! Wow, I have to say that I am really impressed with your review! I didn’t keep track of things nearly so well, but there is always this year. Maybe I should do a forecast/goals blog post!